US$ 1855 / person ? 3 Wangdue – Gangtey Short morning hike to Khamsum Yulley Namgyal Chorten with wonderful view of the valley and it‘s terraced paddy fields. See the longest suspension bridge in Bhutan stretching the length of 350m over Pho Chhu river. Visit of Punakha dzong, which counts as the most intricately decorated castle in the kingdom. Short walk to Chhimmy lhakhang temple, devoted to 15th century saint Drukpa Kunley, know as “Divine madman”, who did taught Buddhism by singing, drinking and rampant sexual behavior. If time permits, also visit Sangchhen Dorji Lhuendrup Lhakhang nunnery with Bhutanese and Nepali style stupa, overlooking the valley from the high hill. Drive to Gangtey and pristine Phobjika valley. Optionally you can attend lesson on Buddhism led by accomplished master with translation to English in Gangtey monastery shedra (buddhist college). 4 Gangtey In the morning drive to Gangtey gompa located at the top of the hill with commanding view of the valley. The historically important monastery belongs to Niyngma school of Buddhism. Walk through village with lots of interesting handicraft shop. From here you will start 2.5 hour walk, one of the most beautiful and easy hikes in Bhutan. You will go around the buckwheat and potato fields to the mixed pine forest with trees decorated with old men's beard lichen and finally you will reach to a view of marshland. Here, in the late autumn and winter, rare Black Neck Cranes can be seen. Descend to valley bottom and visit Kewa lhakhang, the newly established monastery on the place where the demoness was subdued in the past. Drive to local farmhouse to taste local kitchen and other delicacies like the salty suja tea and ara spirit. Then visit to Black Neck Crane center. The birds comes for roosting to the valley in great numbers form November to the end of February. See interesting documentary on bird conservation efforts and related exposition. Rest day in leisure or optionally visit very scenic Ngelung Drechagling Lhakhang nunnery. You might like to try the hot stone bath, traditional Bhutanese treat (on extra payment, need to be ordered in the morning). 5 Gangtey – Jakar Drive to Trongsa over Pele-la pass (3500 m). Stop here to see the shops run by local herders. You can get lot of interesting things here, including the yak wool textiles, dust brush made of yak tail, medicinal plants like puttising root, potent cure for cough and fever or cordyceps dubbed as "himalayan viagra" and energy booster. Continue drive on scenic road with stop at Chendebji chorten which was built to resemble Boudhanath stupa of Kathmandu. Another important stop would be Trongsa viewpoint to see the full extent of the Trongsa castle, which you will visit some more drive afterward. This is the place from where the royal dynasty of Bhutan had risen. Also visit intricate museum in watchtower Ta Dzong. It hosts number of interesting artifacts related to royal dynasty, history of Bhutan and many religious statues and temples. Finally drive to Jakar over Yotong-la pass (3550 m), reaching in the evening. 6 Jakar Visit of sleepy castle Jakar dzong and old Jambay lhakhang temple, which pins down the leg of giant demoness. Walk to Kurjey lhakhang temple complex. After exploring the place, enjoy the picnic lunch on beautiful riverside. Finally continue walk to Tamshing Gompa, the temple where you can wipe your sins by carrying the chain-bar smithed by 15th century blackmisth-saint Pema Lingpa. If the production cycle permits, visit the Red Panda brewery. Explore the town with it’s interesting curio shops and welcoming local restaurants. 7 Jakar, excursion to Tang valley Drive to Tang valley and hike to Ugyen choling palace which hosts wonderful private museum with carefully selected artifacts used in medieval Bhutan for various activities. 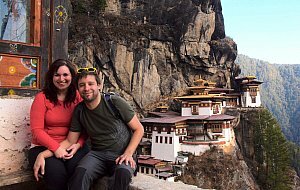 If you feel strong, you can climb to Kundzongdrak gomba overlooking valley from sheer cliff. Otherwise you can visit nunnery, hosting the Buddhist nuns of all ages. You should not miss so called “Burning lake” Membartso where the treasure of scriptures hidden here by magician-saint Guru Rimpoche were discovered by saint Pema Lingpa. 8 Jakar – Paro (by flight) Taking domestic flight to Paro is extraordinary experience. You will see many of the seven and six thousand meters high mountains on the border with Tibet, including Gangkhar Punesum which counts as the highest mountain never summited by men. After landing in Paro, visit National museum and Paro dzong, castle where Bernardo Bertolucci’s Little Buddha film was shot. Explore the lively small town. 9 Paro Drive to castle-ruins of Drukyel dzong, from where you can see the top of holy Jomolhari mountain. Explore the calm Kyichu lhakhang which also pins down giant demoness body. 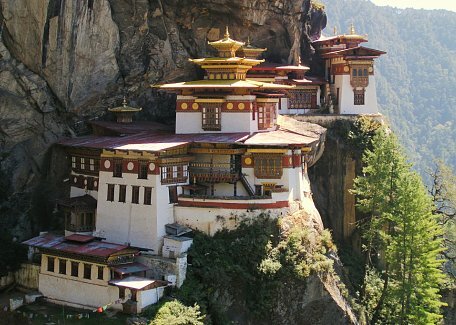 Climb to Taktsang gomba (Tiger’s Nest), is the highlight of the tour. While the hike seems to be hard, it’s very rewarding. If you don’t feel so strong, you can climb just halfway to cafeteria with nice view of the place. You can consider hiking in the morning or early afternoon depending on weather, your fitness and preferences. 10 Departure If time permits, you can make visit to Dzongdrakha gompa, the temple built below the rocky cliff which beauty is only rivalled by Tiger's Nest. Perfect place to give Bhutan good bye! After that you depart from Paro by flight or take 6 hours drive to land border in Phuntsholing. Omit Tang valley (-1 day): If you need to save time, omit the excursion to Tang on day 7. See Historical Heart of Bhutan I, 9 days for details. Díky našemu průvodci jsme poznali život prostých ale vždy usměvavých lidí, klid bhútánských klášterů, barevnost místních tsechu i pohádkovou přírodu. Cestovní kanceláři Firefox Tours patří obrovský dík za nezapomenutelnou dovolenou.